Electronic Kit School. - Maybe it is simple to produce 3V power supply for our device supply. We only need to series two cells battery with each 1.5V for voltage output. So, the result are 3V output. But if you want to produce 3V from single cell battery with 1.5V voltage output, in here we should need circuit or component that can produce 3V from single cell. 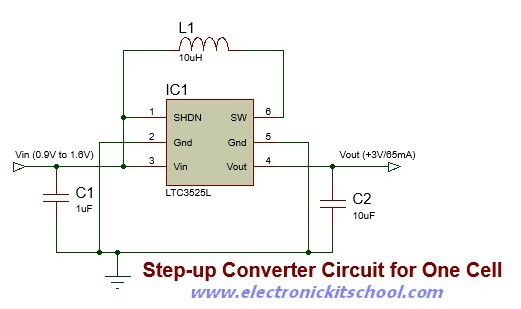 In this article we will show you one electronic circuit that will give you booster converter that can convert step-up voltage from single cell battery more than 1.5V to 3V using LTC3525 IC like in Figure 1 below. Circuit like in Figure 1 above show you about the 0.9V/1.6V from single cell to 3V boost converter circuit using LTC3400 IC. From this circuit we can produce 3V output from single cell battery with voltage input ranged from 0.9V to 1.6V. The main component is used in this circuit is LTC3525L as the DC to DC boost converter. This is simple circuit that arrange from only 4 parts, 2 capacitors, one coil inductor and the main part the LTC3525L IC from Linear Technology. The LTC3525L IC is a high efficiency synchronous step-up DC to DC converter that can start up with an input as low a 0.7V and generates a fixed 3V in output voltage. The nominal output current is around 65 mA therefore you must keep this in consideration if you want to power up devices that require higher currents. We may use a switch between pin 1 and 3 if you want to turn ON or OFF this circuit above.